A roof ventilator serves many valuable purposes for almost any type of building. It not only can remove harmful or unpleasant odors, heat, and contaminants, but it also protects the attic area under the eaves. An excessive build-up of moisture in this area can lead to deterioration of roofing membranes, flashings, insulation, adhesives, and other parts, not to mention any items you may have placed in storage up there. Fortunately, there are a variety of ventilation systems available for almost any style roof that you might have. Whether your roof is flat, pitched, made of tile or metal, residential or commercial, you can install a roof ventilator that will remove unwanted air and allow fresh air to flow in. Many roof ventilator systems have been designed for both residential and commercial use, with energy efficiency in mind. Not only can you purchase wind or solar powered units, but you can also add electric ventilation systems that do not need to be wired into your main AC power source. For example, Ventamatic offers a 12.6 watt, 18 volt DC motor housed in a weatherized grey unit that comes complete with its own solar panel. It can cool up to 1500 square feet of attic space. Airtrack roof void ventilation systems, another form of roof ventilator, are specially designed for those charming flush-fitting tile and slate roofs. These roll-out ridge designs can be adapted to all roof pitches and are suited for both cold weather and warm temperature climates. Since no one wants to spoil the look of your lovely roof, these polypropylene units come in earthy terracotta, brown, grey, and antique red as well as custom colors, and they are purposefully non-reflective. A roof soffit is another approach to attic ventilation. Using intake vents to bring fresh air into your attic promotes a continuous ventilation under your eaves. The tiny .05" louver spacing keeps out bugs and dangerous embers while increasing airflow by being "screenless." The Aura roof ventilator system offers a turbine wind approach that has no moving parts and therefore, very low maintenance. 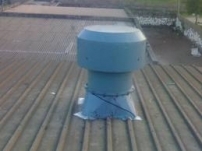 It has been installed on all kinds and pitches of roofs and tested up to 200MPH wind speed. No noise and a low profile are nice features as well as the fact that this is definitely a "green" unit because it is non-electric. In fact, it can save you air-conditioner expense as it it naturally assists in removing excess heat from your home. The windmaster turbine unit also improves air quality by ridding your building or attic of convicted heat and pollution build-up. This system reduces heat radiation from your roof coming into the building, thus lowering your cooling expenses. There are several low-cost, efficient ways to cool your attic or your factory, and in so doing you will be protecting your building from the damaging effects of heat, vapor, and pollution build-up. You will also be improving the environment for your family of employees, all of which will thank you for your appreciation of their comfort needs.